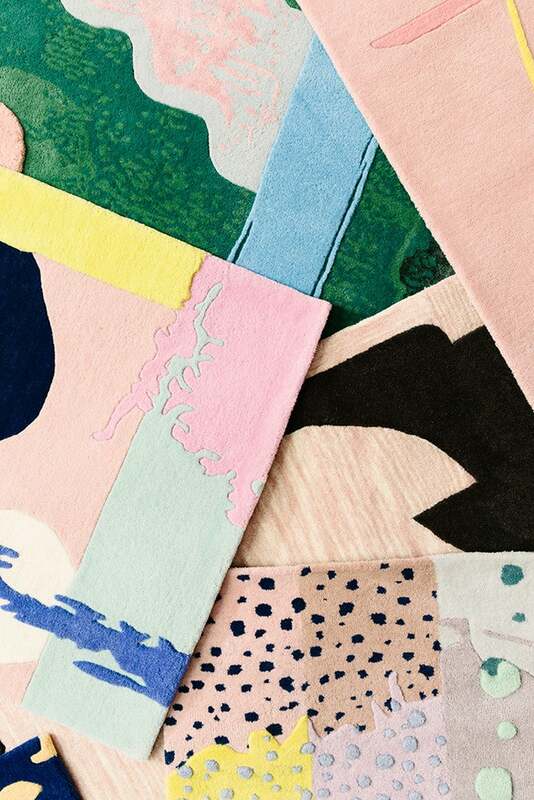 12 of the biggest trends in interior textiles for the year! We’re moving away from the rough-cut, wooden headboards to the more glam and delicate variety. Fabric-wrapped headboards, preferably ones clad in jewel-tones, are making serious headway. This Incy Interiors headboard comes in a mesmerizing shade of pink and an equally luxe velvet finish. Whether they be hand-painted, woven, or graphically designed, we can’t get enough of the “mix and match” pattern look. Our decorative method of choice comes in the form of vibrantly colored rugs (much like this set from Studio Proba! ), which proves that there’s no such thing as too much pattern. The splatter paint effect is nothing new, but we’re all for rethinking the trend with a colorful twist. Case in point: Flat Vernacular’s latest collection of fabrics that embrace the finish within a vibrant palette and intricate detail. These plush textures are an effortless complement to the minimal and modern space, lending depth and a cozy layer of sophistication. Feeling bold? Experiment with throw pillows featuring a slight gradient – dyed sheepskins are making a comeback in a big way! Wallpaper-inspired patterns instantly transform ordinarily upholstered furnishings. A pattern as intricately graphic as this is best reserved for a monochrome decor scheme. This year, we’re revisiting this bedroom staple in a palette featuring new neutrals with slightly smokey undertones: blush roses, soft charcoal grays, and basic blues. Inspired by the Japanese tie-dying techinque, this age old design is refreshed with numerous pattern ways, monochrome linen backings, and sleek metallic accents. Rugs, pillows, sofas, poufs – you name it! We’re taking our love for a graphic color block and transforming it in true geometric fashion. The key to incorporating it into your space without an overpowering hit of modernism? Filtering in warm velvet elements and monochrome pieces. Featuring a complementary pair of color and print – graphic patterns strongly encouraged – this trend inspires a modern revamp reserved for the antiqued with a new lease on life. Going beyond the typical pairing of velvet with the elegant, this luxurious fabric is revived with modern pieces in tinted shades. Vibrantly lyrical color schemes are paired with bold designs to evoke a dynamic aesthetic layered with exotic depth. Delicately bold linens of a Scandinavian-esque feel are elevated with soft neutrals to complement the ever-evolving modern minimalism look.